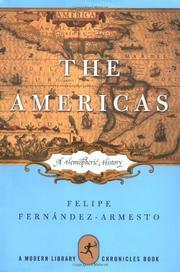 Fernández-Armesto (History/Oxford; Near a Thousand Tables, 2002, etc.) allows that this effort “has not been tried before.” Understandably so, given the wealth of documentary material and the diversity of the peoples in North and South America; a couple of hundred pages is barely enough to cover the political history of Newfoundland, much less two continents and their outliers, which historically have touched on the coasts of Africa and Asia. Faced with a deluge of data and subjects, the author wisely settles on a few choice themes, none fully fleshed, each worthy of longer studies. One is the cultural history of pre-Columbian America, which, he observes, reflects a fundamental ecological imbalance. Whereas South America and Mesoamerica were rich in species and civilizations, much of North America was more austere and less developed, a skewing that continued well into historic times. “The relative paucity of civilization in most of North America cannot be explained by isolation,” Fernández-Armesto writes, going on to offer several explanations that involve, well, isolation, given the effects of topography and climate. Another fruitful theme is the parallel development of a sense of “Americanness” on both continents. At about the time colonial Virginians were beginning to think of themselves as something other than misplaced Englishmen, Creoles in Spanish-speaking countries were calling themselves Americans, affecting native dress, even maintaining that “American nature was superior to that of the Old World—according to some claims, even the sky was more benign and astral influences more favorable.” Fruitful, too, are the tantalizing, sometimes offhand observations on American borrowings of Spanish adaptations to the New World, ranging from intermarriage with Indian people à la John Smith to the proud appropriation of the term “liberal,” and the comparison of frontier-settlement patterns and ideologies in Canada, Brazil, and the US. Sometimes speculative but always solid: a provocative essay that points toward dozens of topics for future dissertations. Budding historians, get cracking.